Hamachi's call-to-arms left me a little hurt, and a little thoughtful. I suppose it's easy to let things go beyond your grasp sometimes. To leak the soul and spirit out of something beautiful by overdoing it. Loaded and shirtless with a can of cheap beer, sweating at 3-o-clock on a Tuesday morning. Keith Richards onetime said, "I wasn't lookin' real good, but I was feelin' real well." 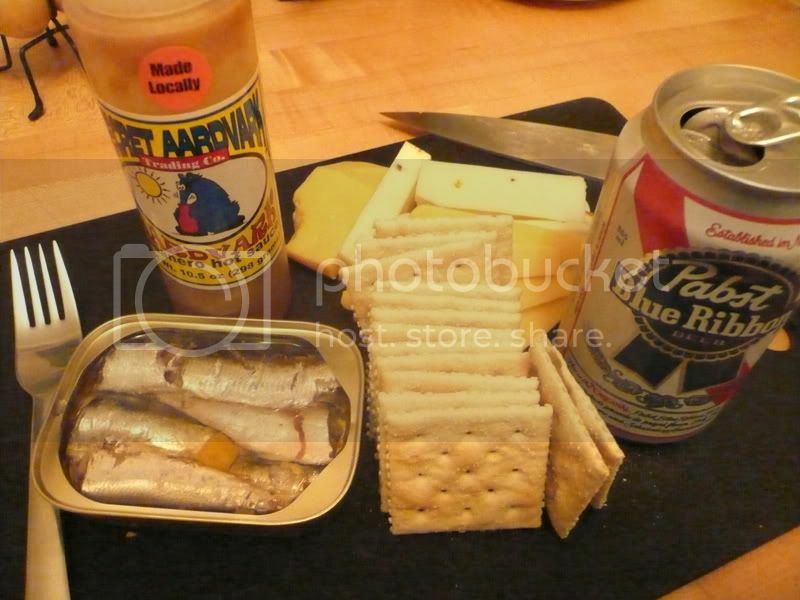 sardines evoke an image of a serious bukowski impersonation where tins and cans pill up with reckless abandon just to do it all over again the next day. i think you found the true spirit of salts. You were howling drunk but you still had the good sense to take a fine picture before you scarfed? Good work. Have you ever tried subbing out the saltines for matzo? You can break them into various long lines where you can stack 2 or 3 sardines in succession on each piece. Add some PEPPER PLANT brand California style hot pepper sauce and you'll have the holy trinity & do that PBR justice. I'll trade you a bottle of Ardvaark for a jar of your "PEPPER PLANT". Deal. I need to go to San Luis Obispo to get some more. I'm down to one more bottle. Next month. When do we get a review? My momma doesn't usually allow me to drink beer on school nights so I have to wait until I get the pass. I'm liking your review formula that includes a hot sauce and a tasty alcoholic beverage. I'll try to find something worthy. You guys have the taste for exotic.